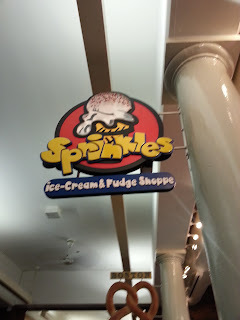 Sprinkles, what a wonderful name for an ice cream shop, don't you think? Well so did Alan and I, so we decided to check it out. Sprinkles is one of the many shops in the Faneuil Hall Marketplace. Ok - When Alan and I walked up to the counter, no one was there, but we only had to wait a few minutes for someone to come around to the counter. Good-ish - We ordered a brownie sundae and though the ice cream was delicious the brownie was a little tough for my liking. I was a tad disappointed when I noticed them not using homemade whipped cream but their hot fudge was super delicious and chocolatey. Good - With the buzz of Faneuil Hall all around us you can't help but get caught up in the atmosphere. 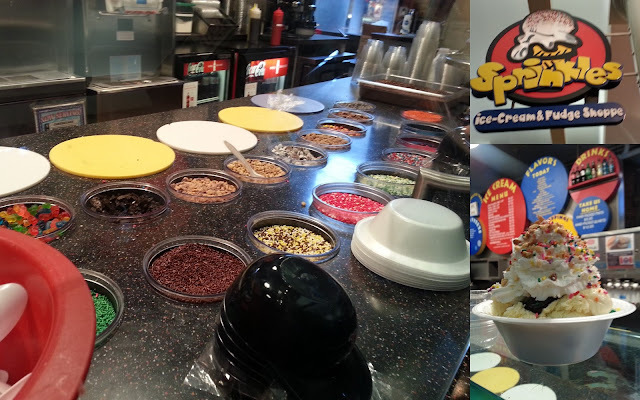 Sprinkles has very fun decorations and all the Sprinkle colors you could ever think of, which is great for kids! Unfortunately Sprinkles doesn't have a running website or a Facebook Page but if you'd like to check out some reviews, check out their reviews on Yelp. Have you snacked at Sprinkles? Let me know, I'd love to know what you thought!